When, at your 12th birthday party, you wished to be able to play laser tag for the rest of your life, you never thought it would come true. And it still won't, but many other wishes are about to be answered by an event that lets you shoot your friends with lasers while taking down energy drink cocktails and bite-sized brunch at a brand-new laser/brunch hybrid experience. 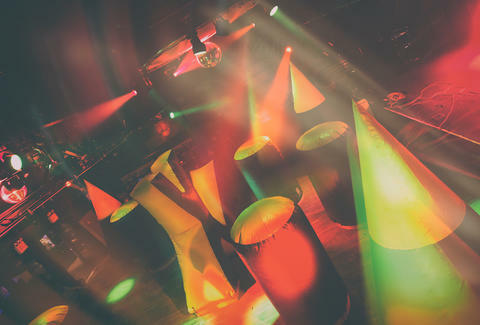 Starting Sunday, April 12th you can head to the Highline Ballroom for Lazer Zoo, a brunch and laser tag "arena experience." This isn't the vomit-inducing spectacle you're likely imagining it to be -- there won't be any running around with a gun in one hand and eggs Benedict in the other (do not do this). Instead, brunch will be held on the mezzanine level, above the laser tag action on the main floor. So you can gawk at all the crazy people running around, fake-shooting each other while you dine. On the brunch front, you can expect dishes like omelet sliders, tuna tartar tacos, and French toast sticks -- plus specialty cocktails with laser tag-themed names, like the Energizer (Absolut Cherrys, Red Bull), the Invincible (rum, pineapple, lime juice, triple sec) and the Force Field (whiskey, peach schnapps, cream, pomegranate juice). 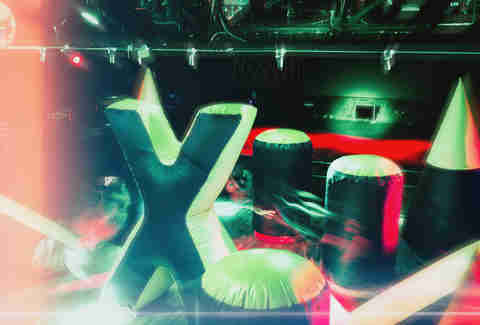 The laser tag arena will feature giant inflatable objects to maneuver around (or push someone into? Or, don't do that...), plus a large LED screen on the ballroom's stage, displaying scores in real time. In addition to the brunching and the laser-tagging, there will be live DJ performances, because of course. The interactive brunch starts at 2pm and goes until 8pm, and you can purchase tickets in advance on the Highline Ballroom's website ($15 for entry + one laser tag game; $20 for entry + one game + one drink). Lucy Meilus is an Editorial Assistant at Thrillist, and has never heard of laser tag or brunch. Follow her on Twitter at @Lucymeilus.